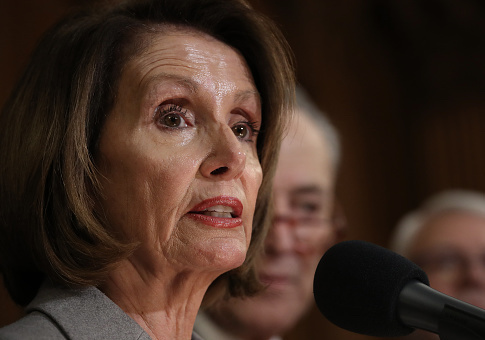 House Speaker Nancy Pelosi (Calif.) and the rest of the Democratic leadership are struggling to present a unified front during the ongoing government shutdown, as moderate and freshmen members of the majority appear eager to cut a deal with President Donald Trump. Since the shutdown started in December, Pelosi has reiterated that the House will not end the impasse by acquiescing to Trump's request for $5 billion to construct a wall on the border between the United States and Mexico. Pelosi, who previously contended that a wall was "immoral," has dug in her heels in recent weeks, drawing fire from members of her own majority. "There’s a number of us on the Democratic side who are quite concerned that we’re not working on negotiated positions and taking the bull by the horns and trying to think about what it would look like," Democratic congresswoman Elissa Slotkin, a freshman from Michigan, told the Wall Street Journal over the weekend. Slotkin echoed that sentiment earlier this week, telling the New York Times she believed Democrats "have a responsibility to get in a room and negotiate" with the president. In response to the criticism and the White House's attempt to court several Democrats viewed as open to compromise, House Majority Leader Steny Hoyer (Md.) asserted that the entire conference was "totally united" behind opposition to a border wall. A group of freshman and moderate Democrats, however, have cast doubt on just how much unity exists in the House majority. Democratic congressman Josh Gottheimer (N.J.), the co-chairman of the bipartisan Problem Solvers Caucus, said during a TV appearance last week there was no reason both sides couldn't craft a deal to reopen the government while strengthening border security. "The idea of walking away is unacceptable. We've got to get the government back open. People are suffering. It's costing businesses in my district. It's costing businesses across the country. And on top of that, we've got to have tough borders. We need to make sure we keep out terrorists and criminals and gang members and drug dealers. But there's not a reason you can't do both," Gottheimer told CNBC's Squawk Box. On Wednesday, Gottheimer along with several other Democratic members of the Problem Solvers Caucus journeyed to the White House for a private meeting with the president to discuss a possible end to the shutdown. It is unclear if any progress was made from that meeting. The congressman's office did not return requests for comment on this story. Democratic representative Anthony Brindisi (N.Y.), a freshman who attended the White House meeting alongside Gottheimer, recently expressed support for a compromise that incorporated border security and immigration reform. "Some element of a physical barrier, better technology, more border agents are all things I support. But we also have to look at immigration reform, reform of the asylum process to clear the backlog," Brindisi said in an interview with a local New York radio station. "We should be working with [foreign] countries to improve conditions so people aren't forced to flee and end up on our doorstep. But we also have to have strong borders, I agree with that." Freshman congressman Jeff Van Drew (N.J.), another member of the Problem Solvers Caucus, told the Washington Free Beacon there was a strong desire among House Democrats to end the shutdown. "The bottom line is we have federal employees who aren’t able to put food on their plates and take care of their families," Van Drew told the Free Beacon. "We have individuals that rely on the government programs who are hurting as well because of this shutdown." "Simply put, we have to come to a conclusion here to get the government working for the people," he added. Van Drew signaled he would be open to a deal that included "electronic fencing" and a "wall" on areas of the border where it was necessary. In exchange, the congressman said he wants to see Congress address the Deferred Action for Childhood Arrivals program. "It might be done by addressing immigration now or as part of a larger compromise later…. Quite frankly, if the president is willing to discuss it and if we can come up with some sort of compromise … We do need more and better border security. In a perfect world, I’d want the government open, good border security, and a fix to DACA.… I think we should all be flexible and work together on a resolution." "People need their government open, this isn’t a game where no one is affected," Van Drew said. "Everybody is being too rigid and that’s part of the problem, we should all be more willing to compromise." This entry was posted in Politics and tagged Donald Trump, Government Shutdown, House Democrats, Immigration, Nancy Pelosi. Bookmark the permalink.